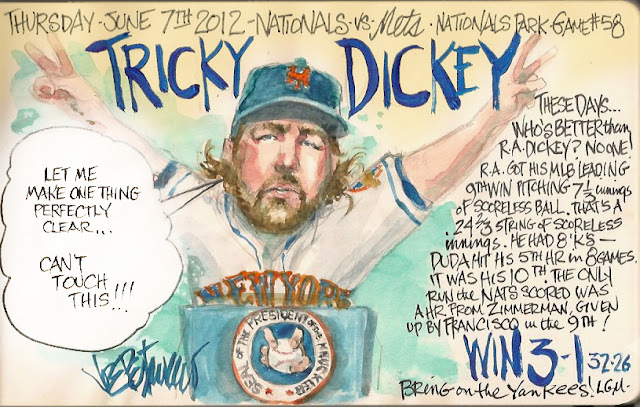 My Mets Journal: Dickey Landslide win in Washington! Dickey Landslide win in Washington! I love Dickey so much. So Do I. I get the same feeling with him on the mound as I did as a kid with Seaver going to the mound. He definitely is a brighter spot for me than Santana. Love Santana but Love Dickey More. I wish the Yankees would have had to face R.A.
WRIGHT TIES HOJO! METS BEAT DODGERS! Mets Now Serving Battered Chicken! One Bad Pitch! Not So Niese! Gee! Where was the Offense? Mets Defense and Offense scarce! Mets drop chance at First! Dickey goes the distance for another Shutout!